For some people, when they hear 'neutral,' they automatically think brown, beige, or white. While those colors do fall within a neutral color palette, neutral is much broader than you might imagine. One such color that falls within this palette is gray and its many variations. Going with a gray color palette allows you to give your room a more chic and elegant appearance while still providing a serene backdrop against which your furniture and accessories can take center stage. It also offers abundant opportunities to introduce other colors and hues within a room. Sophisticated and stylish, gray is a favorite among many of today's designers. This stunning master bedroom shows how gray can impress. Gray walls provide a twist on the traditional neutral look while also giving the room plenty of color and dimension. 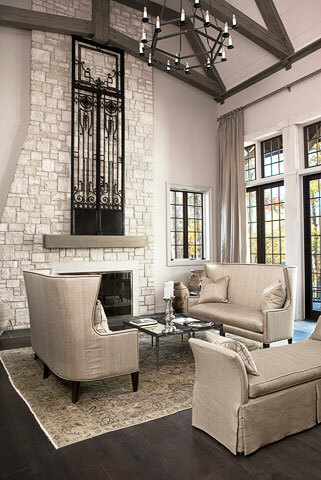 This specific shade of gray also reads very elegant and refined, which reflects the style and overall feel of this room. But gray isn't simply gray. Charcoal gray, ash gray, slate gray, smokey gray, blue gray, pewter, silver - the list is endless. Some shades have warmer undertones while others are a little cooler. Some have more blue while others have a hint of green. Others are rich while still others are light and airy. 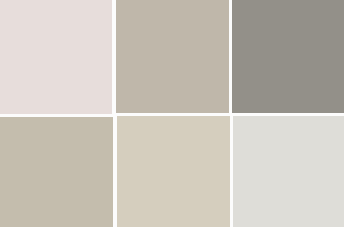 Just as with any color palette, it's important to consider natural lighting, room size, furniture and accessories, and mood when choosing paint colors. Go with shades of gray that complement the undertones in the furnishings of a room as well as shades that look good in both natural and ambient lighting. In the room below, the natural lighting combines with gray walls to create a light and airy space. The artwork above the bed also stands out against the neutral color and creates a nice focal point. This gorgeous stand-alone tub makes a statement against the cool gray walls in this master bath. Here, gray flows effortlessly throughout this open living area and gives emphasis to the wood beams and dark interior window trim beautifully. 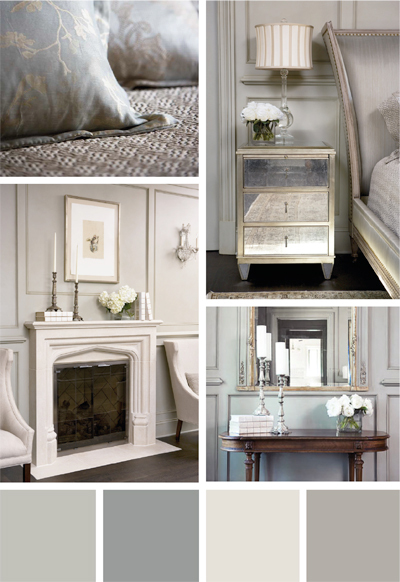 Our design team personally loves a neutral gray color palette. Here are a few of their favorite go-to gray paint colors. When it comes to choosing neutral colors, do you like beiges and browns or are you a fan of gray? If you like the look of the stunning master bedroom from this lake home, we're showing you how you can get the look yourself as part of our Designers' Corner section of our online boutique. Learn how you can purchase the gorgeous bed, bedside chest and many of the room's accessories. Additional images from this lake home can be found on our Web site.